The file memtest is your final payload which you can use with coreboot, either on real hardware or in a QEMU image. 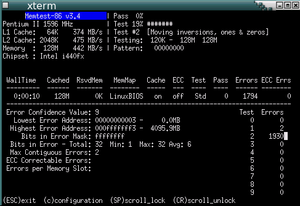 Prerequisite: on non-i386 hosts be sure to have the i386 libc installed (e.g. libc6-dev-i386). The file build/coreboot.rom is your final coreboot image, which also contains the payload. Please follow these instructions if you want to try out coreboot and Memtest86 in QEMU. This page was last modified on 9 October 2012, at 20:55.